My rating in words: LOVED IT! This book was adorable, real and relatable and I am just sorry I had this on my shelf for months and took so long to read it. Because once I finally started… I finished it in about 2 days. It’s that good. Eliza and her Monsters is an ode to fandom and online friends. It explores so many things relevant to today’s society such as the question if online friends are real friends (oh yes they totally are) and the power of an online fandom, especially for the online content creator themselves. Eliza is one of my favorite characters I’ve ever read about. She’s a shy girl who loved eggs, dislikes exercise and prefers to spend her time online. She’s also the creator of a super famous web comic called Monstreous Sea, which she created anonymously. And I just related to Eliza so much. She felt like me, except for the fact that she’s super talented at drawing and a megastar online and I… well, I fangirl about books online, hah! Wallace was also such a great character. He has his own issues and past but he quickly bonds with Eliza over their shared love of Monstrous Sea and they start a friendship that slowly turns into something more. I loved their interactions, especially because they were often relating to the fandom and art (since Wallace is a writer, and loves writing fanfiction) and a lot of their talks are in writing. I have a thing for talking in writing, probably because I personally also feel more comfortable writing than talking and I feel like it allows people to be more honest and real with each other. So Wallace and Eliza’s interactions really resonated with me and tugged on my heartstrings. The mental health rep in this story was also so well written. The book tackles topics such as anxiety, depression and even suicidal thoughts in a way that felt very real to me. Especially the reactions to it from other characters, who didn’t always respond in the right way to it, even if they meant well. As I said before, I adored that this book focused on online friendships. We get a lot of chats between Eliza and her two best friends, Emmy and Max. And I loved that even though they lived so far away from eachother and had different ages (Emmy’s 14, Eliza’s 17 and Max is in his early twenties), they were there for each other and just had a strong connection. It really showed the beauty of online friendships, even if they are not always understood. The family aspect in this story also deserves some praise. Eliza’s family was very present in her story but also flawed in a realistic way. Though Eliza never feels like she fits in with her family because their interests couldn’t be further apart. (There’s a scene where they force Eliza to go on a camping trip with them, while taking away her phone and sketchbook and I felt that whole scene in my soul) Her parents love her and are proud of her, even if they don’t understand her or what she has accomplished. Her brothers tease her and make fun of her, but they are there for her when she needs it. This family just won me over completely , flaws and all. And if all that hasn’t convinced you yet to give this a try, allow me to mention that the story is also filled with beautiful art from Monstreous Sea that you’ll definitely wish was a real comic. Overall, I adored this book and highly recommend it. 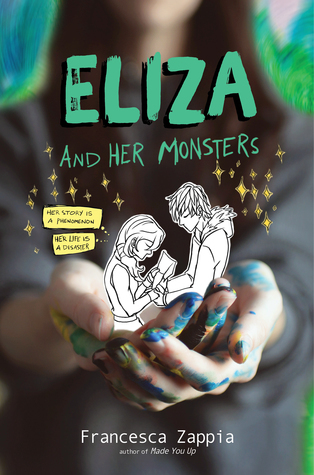 If you love fandom stories, a whole lot of internet dynamics, great mental health rep, relatable and adorable characters, online friendships and flawed but lovable families, then Eliza and her Monsters is THE book for you. “There is a small monster in my brain that controls my doubt. “I do have friends. Maybe they live hundreds of miles away from me, and maybe I can only talk to them through a screen, but they’re still my friends. They don’t just hold Monstrous Sea together. They hold me together. HAVE YOU READ Eliza and her Monsters? WHAT DID YOU THINK ABOUT IT? AAAAAAH!!!! Yes to everything in this review! I read this a couple of weeks ago and loved it sooooooo much! Everything about it was so amazing and I loved the illustrations too…. I want to read Eliza’s full web comic!! So glad you loved this too! It was amazing indeed! Those quotes are AMAZING. And I love the sound of Eliza and the online friendships – I think I’d relate a lot to her. Brilliant review, Lindsey. Yay for loving this book! I STILL haven’t gotten around to reading this yet ARGHHHHH, but your review makes me want to read it even more than before. Ahhh I hope you’ll get to it soon and you’ll love it just as much as I did! WOW Good post! I really like how in detail you went in your review. It really shows you are a qualified reviewer. You just earned another subscriber! Jared @dabook.club recently posted…Book-Movie Review: The Maze Runner Trilogy. Oh wow, thanks so, so much! GAH!!! I LOVE this book! I had trouble with how Wallace reacts late in the book but other than that I ADORED it! I really loved their friendship and how it turned into more. I hope more books do illustrations adds too as I enjoyed that part of the story. Great review Lindsey! I can’t believe I still haven’t read this book! Can’t wait! Ahh Marie, I’m pretty sure already you’ll love this one as much as I did! At least, I hope so 🙂 Can’t wait to hear your thoughts! I don’t even think I have this on my TBR yet, but wow, it sounds so amazing! Everything you mentioned makes me think I’d love this book too. Wonderful review!